We add the meta-tags, that is, Title Tags, Keywords, Descriptions to all pages to help search engine optimization (SEO), and keep these in mind while writing the content. We also keep in mind that search engines also look for the actual site content to decide their rankings. From our experience at Entheos, it’s a quality site with quality content that attracts both humans and search engine bots. Take a look at our content writing portfolio for samples of our work. 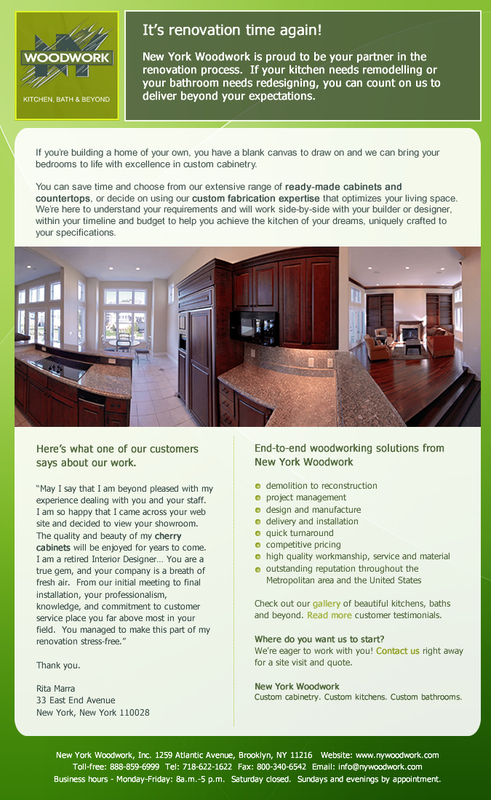 Our client owns a woodworking business that creates custom cabinetry, kitchens, bathrooms and more for home owners and corporate clients, architects, builders and interior decorators.Entheos had done a website, brochure, emailer and flyer for him some years ago. He was happy with our work and came back to us to update his website to a responsive website that would be accessible by all devices. 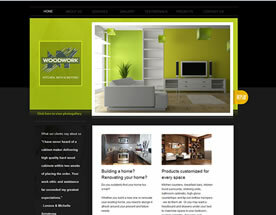 Entheos completed the custom website content writing and customization of Template 52423 for our client. Entheos did the template customization for this site and added the photo-gallery No 24 of Entheos, customized with the client’s photos in three categories: Kitchen, Bath and Beyond. We also did the custom content writing for the site and for the custom-designed brochure (below). From the testimonials the client had given us, our writer drew out important information regarding the company's track record: high quality work, affordable prices, quick turnaround time and delivery on or before schedule, understanding the customer’s requirements, providing personalised service, exceeding client expectations. These factors were accented in the content where New YorkWoodwork was presented as “the professional partner” of its customers. More details about individual product lines were provided about custom woodworking for Kitchen, Bath and Beyond in the Services section, with links to the photo gallery. In the Projects section, we added interest to the pictures with brief descriptions of custom woodworking projects, from the materials used to the finish and style. Extracts from relevant testimonials add authenticity and credibility in this section and in the Testimonials section, where they are linked to the complete testimonials. Our client was pleased with our work and came back to us for a Flyer and Emailer which used client testimonials to promote their home renovation and redesigning services. 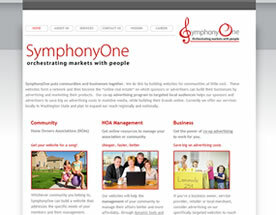 Our client entrusted us with the task of writing custom content for his fresh new company, SymphonyOne. The company puts home owners’ associations (HOAs) and businesses together on the internet for their mutual benefit. Entheos wrote content for Home, About and Services, and added content to the Careers page. We also edited all site content. Business concept: Content explains the concept of co-op advertising as it applies to HOAs and businesses on an online marketplace. Services provided by the company are promoted in detail and the benefits to the key players are highlighted. Content for Banner ads on the rates page (downloadable pdf document) was added as a result of a suggestion from Entheos. Fresh content was added to the Careers page for which content was provided by client. 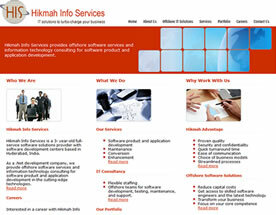 Hikmah Info Services is a .Net development company and a full-service software solutions provider. Hikmah provides offshore software development services and technology consulting for product and application development. Entheos received minimal inputs for content and custom-developed all the website content for the Hikmah website from scratch. Study of competitive sites and research on the internet enabled us to provide this client with a well-rounded view of his business. At-a-glance home page quickly takes the reader into the place in the website where s/he can get more details about a particular aspect of the business, whether it is the business model or the services provided by the company, or the advantages it offers. Bullets for quick text highlights lead viewers into content or give a brief overview of the subject of the page. Tagline in header: “IT solutions to turbo-charge your business” emphasizes what the company can do for your business. EQS is a provider of Software-as-a-Service and Data-as-a-Service in a customized online solution known as the Qshare Small Business Solution. 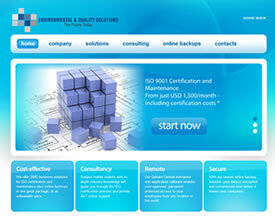 Qshare enables small businesses to achieve ISO certification and maintenance. The homepage is packed with at-a-glance information that addresses the SME target audience. Content boxes under the header highlighting the benefits of the Qshare Small Business Solution – security, remote access, cost-effectiveness, expert consultants. The headline “SMEs! Get ISO 9001, ISO 14001 and OHSAS 18001 certification under one roof” sums up the message in a single sentence while the content provides an introduction to Qshare services, the Qshare Central application and its benefits. Inner web pages spell out the details about the company and its solutions, consultancy services and data backup solutions, and the sign-off line invites the reader to take action and contact EQS. The client received good feedback on the website and engaged Entheos to design and write a custom presentation folder and brochure. The cover content design draws in the target audience while focusing on ISO 9001, ISO 14001 and OHSAS 18001 with watermark text. The brochure copy follows the text of the website but required editing for a trifold brochure (A-4 size after folding). 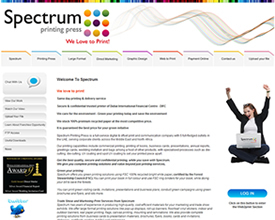 Spectrum Digital Printing Solutions is a leader and pioneer in the printing industry in the Middle East, an established company poised for the next phase of growth. Entheos provided custom website development, a Flash introduction and content writing for the Spectrum website. Prompt communication with the client at every stage enabled the Entheos team to complete the task to satisfaction, ahead of the scheduled deadline. Content writing of forty-one pages focused on the strengths of the company, its credentials as a reputed printing business based in Dubai, with five offices in the Middle East and North Africa, providing a broad spectrum of printing services. Detailed content on each page along with bulleted text and subheads emphasizes the main benefits of the service concerned. Headlines and subheads along with images break up text into readable chunks. Our content writer recommended the addition of a paragraph on every page that cross-sells Spectrum’s capabilities in large format printing for Trade Shows and Marketing. Our client approved and built on this suggestion, by requesting the addition of a paragraph on green printing on every page. This text draws the attention of the reader to other products and services offered by Spectrum, including eco-friendly FSC 100% recycled bright white paper, certified by the Forest Stewardship Council (FSC). This aspect was the main focus on the home page but was later reinforced on every page, with the addition of two lines of content that emphasized quality, confidentiality, and value. A call to action on every page invites readers to respond with an email or call. Soon-to-be-launched services like web-to-print and news like cross-media services are presented in the content. Their benefits are accented in subheads. 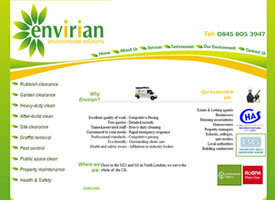 Our client, Envirian Environmental Solutions provides cleaning and environmental solutions across the UK. From logo to custom design and custom content, Entheos provided a complete solution for the Envirian website, the face of its business to customers. Understanding the cleaning business was the first step in writing the content. This involved extensive reading, research and understanding of the terminology of the industry and of environmental-friendly cleaning methods. Web content for Envirian had to address many different target groups, from home owners owners to real estate agents, building contractors, commercial establishments and offices, housing associations, educational institutions and local authorities. Bulleted text on the homepage telegraphs the advantages of Envirian while the introductory content leads into the About Us page. Services are presented in detail under the different heads of commercial cleaning, contractor cleaning, residential cleaning and other cleaning services. Subheads help to break the content into smaller chunks for easy reading. A personalized call to action on every service page reinforces the company's strengths and invites the reader to contact Envirian with an enquiry. Metatags for all pages including Testimonials and Our Environment for which content was provided by the client. 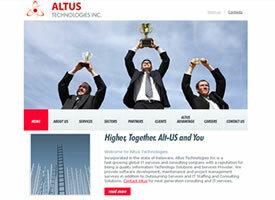 Altus Technologies is a global IT services and consulting company providing Information Technology Solutions and Services. Our client provided the basic content inputs for the Altus website, but we at Entheos have developed on these for a better connect with target audiences (potential clients and employees.). To begin with, our assignment was to write fresh content for four pages in the site, but grew to include editing, re-writing and SEO for all pages. Wrote fresh content for four pages, ie: Careers main page, Clients page, IT Services and Consulting Solutions (services main page), Sectors page. Added a call to action in the form of a personalized "Contact us" line unique to each page. 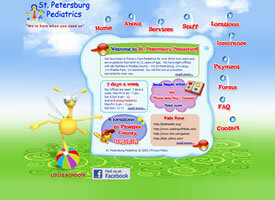 Our client asked us to customize a template and write content for St. Petersburg Pediatrics, a well-established 32 year old group of pediatric clinics in Pinellas County, Florida. Regular communication between the client and Entheos enabled us to deliver quality content and template customization. Quick snapshot of the company on the home page: The home page has a brief track record of the company, its Locations in Pinellas County, Timings, Special Events in which the company is involved and a ‘Kids Zone’, featuring links to children’s sites. About us section features the credo of the company, describes the kind of people working there and what they work for. It also has a write-up about the Founder, Dr. Mariano Cibran. Services include lab facilities, immunizations and screening tests, well child examinations. The section on Meet our Staff presents staff bios with their pictures, giving the feel of a friendly clinic with experienced staff where both parents and children can be comfortable and sure of professional treatment. Insurance accepted is spelt out in detail, also how to pay. The Insurance page lists out all the companies giving medical cover where the company is listed, and the Payment page allows online payment through Paypal. The Forms page has links to all the forms needed by the patient and there is an FAQ page that answers common questions of parents. Would you like us to write website content for you? Contact Entheos and get started!